There is a new product on the market, although not really seen in too many stores [for the time being]. The Katif B’Golan Company was founded by Eyal and Ayelet Hadad, formerly residents of Kfar Darom. Following the events of the summer of 2005, the Hadads, who grew vegetables in Gush Katif, found themselves without a home or means of support, eventually joining the Golan Heights community. 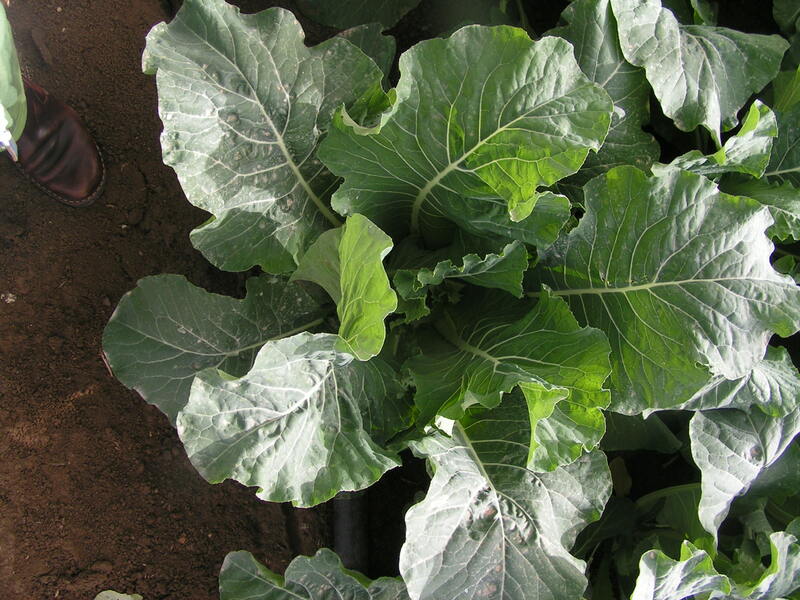 Eyal decided that he is best off trying to do what he knows best, but this time around, he was going to try to grow bug-free vegetables that are not readily available in the shuk, focusing on cauliflower and broccoli. “He experimented during the year before shmitah” explained Ayelet during our telephone interview, adding that during shmitah year they did not work. Now, after forming an official partnership with another former Gush Katif resident, they are working in earnest and are back in business. Ayelet explained to me the climate in the Golan is favorable since in the spring, the nights are cool and that is a major plus as opposed to the south, where the heat is unrelenting. It is amazing how Hashem works since the product labeled Katif B’Golan is not seen in the Jerusalem area, but during my recent tour of the Jerusalem Crowne Plaza Hotel with Rabbi Yosef Fink, we entered a kitchen as the hotel’s head chef was examining two samples of cauliflower and broccoli bagged as ‘bug free’ with a hechsher from the Tzfat Local Rabbinate, Rabbi Shmuel Eliyahu Shlita, Rav Bistritzky and Rabbi Samuels of the Golan Heights Local Religious Council. By the way, the chef was extremely impressed as to the quality of the vegetables, with the cauliflower being whole and the broccoli in nice size pieces, not chopped or chunked up. 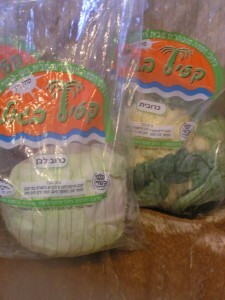 Rabbi Fink told me that he knows Rav Samuels and he is most trustworthy, and we are both familiar with Tzfat’s Chief Rabbi, Shmuel Eliyahu, who happens to head the Green Vegetables division of the Chief Rabbinate of Israel, and for those who know Rav Shmuel, he is meticulous regarding greens, the ‘bug free’ brands, constantly checking and inspecting the various firms to ensure they maintain a standard justifying their hechsherim. On the other hand, I was quite skeptical since one does not usually find a whole fresh cauliflower [although available] with a reliable bug-free hechsher, so I decided not to take the wrapper on face value. My search led me to the Hadads, and ultimately, I spoke with Rav Bistritzky at the Tzfat Rabbinate, who confirmed the hechsher printed on the Katif B’Golan bags is indeed legitimate. Ayelet Hadad told me that they are not looking to penetrate the Jerusalem and center of the country market since there is already someone from Sussia (in the Southern Chevron Hills area) who relies on these areas for his livelihood. She explained that they are not yet set up regarding marketing and distribution but do have an ample supply of produce. She hopes to focus on the north for now, confident there is enough business without infringing on the territory of others. Katif B’Golan also has celery, lettuce and other products, but is not growing leaves (parsley, dill and the like). Nina’s Restaurant in the Paran Shopping Center in Ramat Eshkol, Jerusalem, is now under the supervision of Rav Rubin Shlita. Hess Restaurant in downtown Jerusalem is now under the supervision of the Jerusalem Religious Council Mehadrin. Kohinoor Restaurant in Jerusalem will no longer be glatt mehadrin as of July 1st according to the hotel’s rav and chief mashgiach, Rav Yosef Fink. He explained the restaurant will still enjoy his supervision and the hotel’s standard, but it will no longer be bishul yisrael for Sephardim and a mashgiach will not remain in the restaurant at all times, presenting a problem regarding the pouring of wine. The meats and poultry will also no longer be Agudat Yisrael. Rabbi Fink point out the decision is the restaurant’s, apparently based on financial considerations. Following the recent publication of the Chief Rabbinate dated 26 Tammuz, I have spoken with R’ Yehuda Gross at the Eida Chareidit, who informs me that any bug-less greens sold in stores without an Eida stamp on the package are not under their supervision. He stressed that this holds true for bug-less greens that may be found in stores under Eida Chareidit supervision, but added this should not be the case – namely they should not be selling non-Eida greens. As a reminder, the Chief Rabbinate warns the public to distance themselves from the “Alei HaSharon” and “Yivulei HaNegev” companies, both claiming to be bug-free while in actuality, they are quite infested. NOTE: As per tests conducted by Rabbi Shmuel Eliyahu Shlita, Chief Rabbi of Tzfat, there are many companies on the marketplace advertising themselves as bug-free, even displaying the stamp of kashrut agencies on their package, but in essence, they are not what they claim to be. The Otzar Haaretz and the Machon HaTorah V’Haaretz operations that existed during Shmitah year are ceasing and there will no longer be an Otzar Haaretz certification. Posted on June 23, 2009 by JKN Israel. This entry was posted in JKN Alerts. Bookmark the permalink.